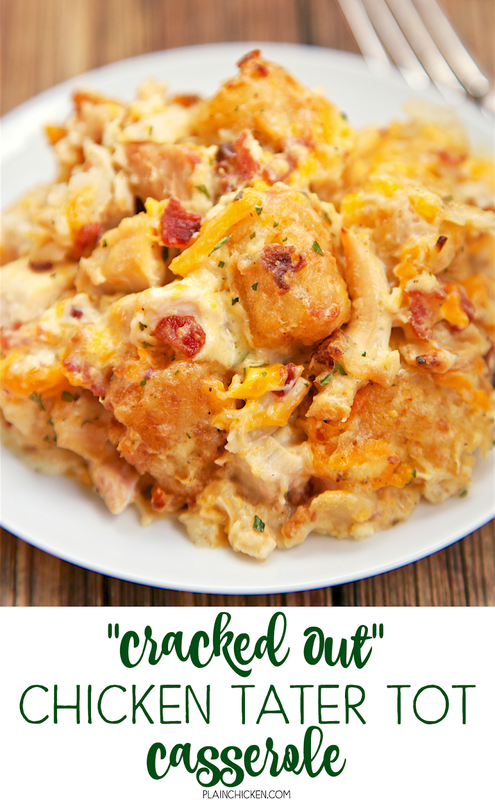 Cracked Out Chicken Tater Tot Casserole - You must make this ASAP! It is crazy good. 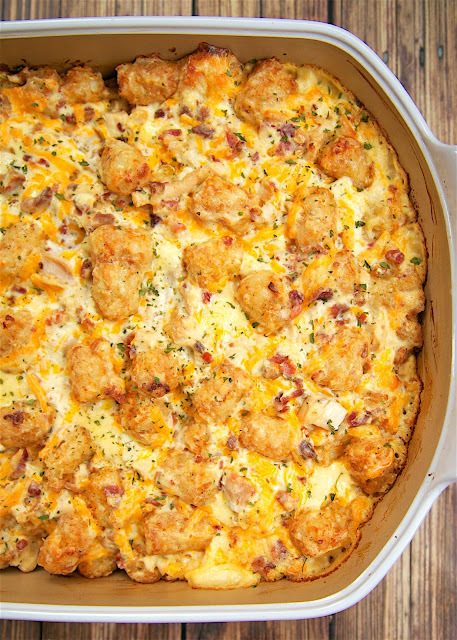 Chicken, cheddar, bacon, ranch and tater tots.You can make it ahead of time and refrigerate it or even freeze it for later. I usually bake half and freeze half in a foil pan for later. Everyone gobbled this up! Even the super picky eaters. 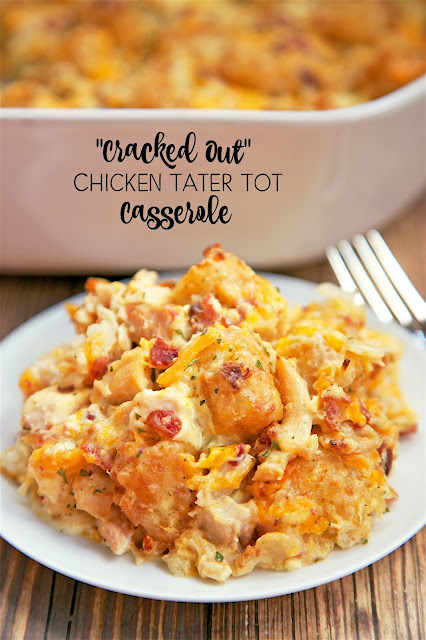 Stop what you are doing and add the ingredients for this "Cracked Out" Chicken Tater Tot Casserole to your grocery list. You must make this ASAP! It is crazy good. Chicken, cheddar, bacon, ranch and tater tots! I mean, what's not to love?!?! This casserole only takes a few minutes to put together. You can make it ahead of time and refrigerate it or even freeze it for later. Since there are only two of us, I usually bake half and freeze half in a foil pan for later. 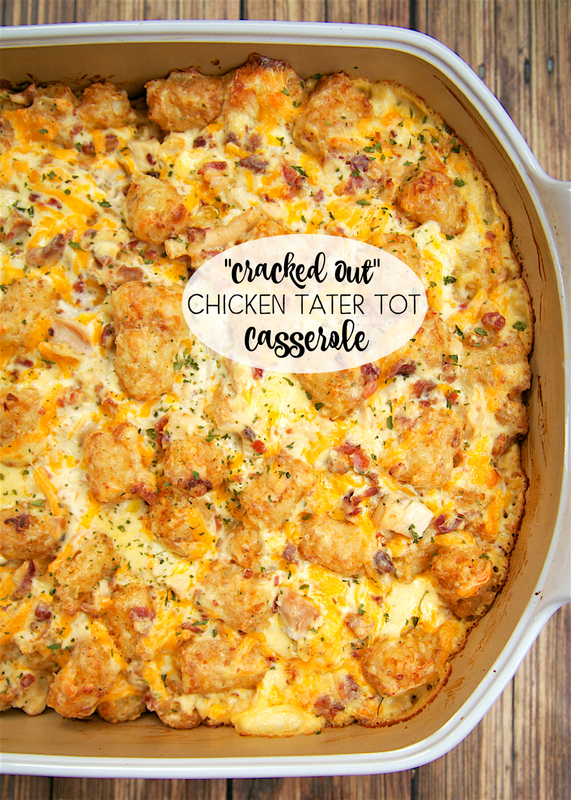 I love being able to pull this casserole out of the freezer on a crazy busy day. In a large bowl, mix together chicken, sour cream, soup, Ranch mix, bacon and cheese. Fold in frozen tater tots. Spoon mixture into prepared pan. Bake for 40-45 minutes, until bubbly. I'm assuming that you cook the chicken before putting the recipe together? Unknown - yes - the first ingredient is "3 cups chopped cooked chicken"
This was delicious. And the leftovers were even better. Thanks! Thank you for the great recipe. I subbed a jar of lite, gluten-free alfredo sauce for the cream of chicken to make mine gluten free. It was seriously delicious! I don't think it tastes Ranchy - it does season it, but there is a lot of other flavors with the chicken, cheese & bacon. I think you could sneak it in. Can you freeze it? If so, before or after baking? I would freeze it before baking and thaw it before baking. oops, sorry....I see the answer in the instructions. You mix the tatot tots in with the mixture? You mix the tator tots into the mixture? It is delicious! So easy to make once you get the chicken deboned. Do you think a can of Progresso cream of mushroom soup will work in this recipe? Thanks! We use the progresso cream of mushroom because it's gluten free and add chicken bouillon powder in it! Sometimes when I do this I sometimes use cream cheese but since there is door cream in the recipe you don't truly med it. If you want the soup to be thicker since it isn't condensed use corn starch or tapioca starch. Do you think italian season pack would ruin it? No ranch on hand?? My daughter used Montreal chicken seasoning for another recipe when this popped up on Facebook. It was great with that. can you use raw chicken? I have a different recipe that uses raw chicken and it bakes @ 400 degrees for about 20 minutes. I was wondering if you think that would work. you can certainly try it. Let us know how it turns out. So good! I made a mexi version by adding a tin of sliced jalapeno's, niblet corn, and cooking the chicken in fajita spices. That sounds great! I think I will do the same. Thanks! Can this recipe be done in a crockpot? what would be the heat and time? This was delicious! I added frozen peas to mine. What can be used as a substitute for the sour cream? I added a can of cream of cheddar soup as well. Devine! This was delicious! I used 2 packets of ranch because we love ranch. Definitely making again! Thanks for sharing this recipe. Will uncooked diced potatoes work instead of the tater tots? I would think that would be fine. Enjoy! Will shredded chicken work as well? Will fully cooked oven roasted diced chicken breast found in the frozen section work for this recipe? I was thinking about making this to take to a family Christmas party that will require 4 hours of driving. Will it need to be reheated or is this something that will be yummy even after it has cooled? I was thinking about making this for a family Christmas party that will require 4 hours of driving. Will this need to be reheated or will it still be yummy after it has cooled? It would be ok at room temperature, but I think it would be a lot better warm. I would reheat it in the oven or microwave for a bit. What can be used to replace the sour cream? I did not cover the dish as it baked. What's the prep time on this? Do you think it would be ok to use cooked tator tots instead of frozen? do you think it would be ok to put the tots on top so they get a bit crunchy on top? Misty, I see no reason why you can't omit the ranch seasoning. As for a substitute, I'm not sure, probably any flavor you prefer. Good luck! I bet onion soup mix would be delish in this! I swear if these folks would just read the recipe and directions, they would find the answer to their question. Someone else asked how many this dish serves, but I didn't see an answer. So could you tell us how many it serves? I'm planning on making it for a party of 10-12. I'm also serving it with a vegetable tray and fruit. The servings are clearly listed above the recipe photo - to the left of the print button. This will serve at least 8 people. Curious if cream cheese can be substituted for sour cream? I see where you suggested Greek Yogurt, but I have a picky eater that won’t touch it or the sour cream. Can I make the cream cheese work?? That isn't a traditional swap, but you can certainly try it. Good luck!! This looks amazing! I love how on these recipes everyone always tells you how they changed it from the original instructions or even better, asks ridiculous questions that are clearly stated already in the recipe directions. C'mon people, just read and understand! I made this casserole for my coworkers today and it was a huge hit. This casserole is SO GOOD! I don't have access to an oven at work but I wanted it to be hot at lunch so I cooked it in my slow cooker. I put everything together this morning (following the recipe exactly)and cooked it on high for about 3.5 hours. It probably should have gone another 30-60 minutes because the middle, while hot, was not quite as done as the edges. In any event, if you use a slow cooker, don't expect it to look as fabulous as it does in the pictures above but the taste is definitely still there! I made this for a super bowl party and it was a hit. I had to bake it a little longer than the recipe called for because I wanted my tots to be golden golden brown. Maybe Mayo mix with extra soup? How long would cooking time be if you doubled the recipe? I've never doubled this recipe in one pan. I can only guess at how much extra time would be needed. I would start at about 15 to 20 minutes. Just make sure it is bubbly and then it is done. Do you think you could substitute cauliflower or broccoli for the tator tots to make it more keto friendly? How much ranch dressing mix should I use? Recipe calls for one 1 oz. package but can't seem to find 1 oz. packets at my local grocery stores. If I make this the night before and the tater tots are thawed, what would the cooking time be? It should be the same as written above.